“Park Picks ” our one-page weekly newsletter brings you the latest and greatest in Friends-related activities, park news and other items of interest. To be on our mailing list please contact info@allentownparks.org, phone 610-432-7275 or subscribe on-line (on homepage). Click Dates to Download PDF versions. New Educational Program: Get Back to Nature! Park Picks 08.08.18 – New Program – Get Back to Nature! Park Picks 02.18.18 – 2018 Events – Save the Dates! Cedar Sports Day Special Edition – 2nd Annual Cedar Sports Day! Park-Picks-8-29-16 – 5th Annual Woofstock – Come Out, One and All! Park Picks 04.04.16– 19-Park Clean-up! Park Picks 03.21.16 – Come Visit Allentown’s Parks! Park Picks 10.12.15 – Insects & Fishing – What a Weekend! Park Picks 6.15.15 – Coming up- Art in the Park, Sailboat Building and Race & Allentown Woofstock! Park Picks 9. 29.14 – NPLD “Greening” Event a Success! Park Picks 09.08.14 – Woofstock Fun! Park Picks 8.25.14 – Woofstock is Coming! Park Picks 6.23.14 – Art in the Park – tres chic! Park Picks 6.16.14 – Upcoming West Park Events – Be There! Park Picks 3.17.14 – Upcoming Volunteer Events – WE NEED YOU! Park Picks 02.10.14 – Allentown Winterfest + Snow = FUN! Park Picks 09.30.13 – 2013 Natl Public Lands Day – a Great Success! Park Picks 09.09.13 – WoofStock FUN for Everyone! Park Picks 07.08.13 – 2nd Annual Model Sailboat FUN! Park Picks 06.24.13 – In search of…Volunteers! 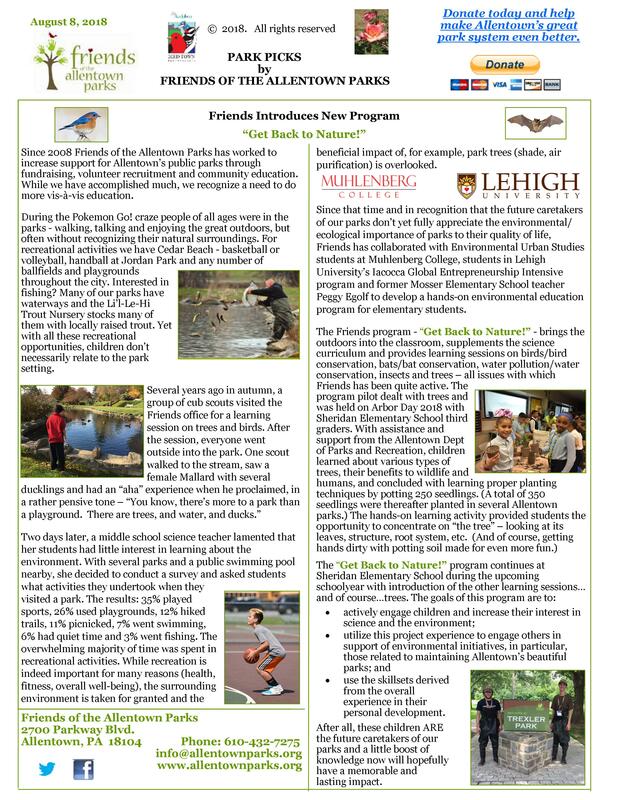 Park Picks 04.22.13 – Earth Day and Great American Cleanup of PA at Muhlenberg Lake, WoofStock! Park Picks 11.12.12 – Tree Replacement Campaign – Please help! Park Picks 10.15.12 – Wildlife in Trexler Park & Worldwide Day of Play a Hit! Park Picks 7.23.12 – National Public Lands Day & Barkfest! Park Picks 7.9.12 – Model Sailboats + Kites = FUN! Park Picks 10.31.11 – Backyard Birds for Beginners, Hex Signs and Happy Snowy Halloween! Parks Picks 8.15.11 – We’ve Moved!